Character, Plot and Verisimilitude | Stavros Halvatzis Ph.D.
HOW do you achieve verisimilitude in stories? Make your story a consequence of character instead of making your character a mere pawn of the plot. In other words, have character, typically your protagonist, drive the story forward in a convincing and germane way. This is not as complicated as it may seem if you ensure that your protagonist’s traits are in keeping with his actions at the nodal points of your story. 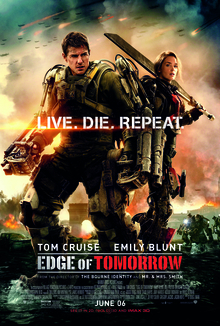 In Edge of Tomorrow, for example, Major William Cage initially refuses to do his job of filming the allied landing in France against the alien invaders. This action aligns with his trait of self-preservation. But when the General orders Cage to the front as a private, an encounter with the enemy results in alien blood being spilled on the major. This endows him with the power to keep returning to the moment of his death so he may take a different path. Through trial and error he learns to use this power not only to survive in a personal sense, but to try and defeat the enemy in order to save humanity, and specifically, the woman he has fallen in love with. His focus on self-preservation has expanded to include the preservation of the human race. His heroic actions at the end, when he loses the power to return to the moment before his death, reveals that he is willing to sacrifice his life in one last-ditch effort to save the world. The trait of selfishness has given way to the hitherto hidden traits of self-sacrifice and duty, awakened by the endless series of hard knocks he has endured. His actions at the nodal points, therefore, are determined by his inner traits and are part of his character arc. Similarly, in The Nostalgia of Time Travel, Benjamin Vlahos’ choice between seeking safety in his cyclone-resistant house, or letting the storm end his life lies in the tension between his sense of guilt for the death of his wife, and the love he bears his parents. Ultimately, a third characteristic, his gift of intelligence, arbitrates between the first two warring traits. His decision, an inevitable consequence of his character, results in appropriate action and is a major turning point in the story. Make your protagonist’s actions an inevitable consequence of warring traits. This will help lend your story verisimilitude. Are your Stories Plot or Character Driven? This entry was posted in On Character and tagged amwriting, Ian1, novel, novelist, screenplay, screenwriter, story, Verisimilitude, writing on July 30, 2017 by Stavros Halvatzis. Great Post . If I I understand this correctly , a verisimilitude occurs when a character discovers a greater truth in themselves , resulting in them to rethink their situations and make a u – turn that effects their destiny. It’s almost an emotional flipflop that changes the character arch. Good Will Hunting : Will does not want a relationship with anyone if it means confronting his past. Will bursts into a rage when a girl wants a relationship with him despite his emotional baggage. After opening up to a trusted friend Will finds his way and drives across the country to be with the girl. The Lion King : Simba wants to be king. Runs away from home after being framed for murder. Lives a care free life and assumes a new identity. Is confronted by his past , refuses to accept his responsibility. Gets some sense literally knocked into him and goes on his quest to reclaim his thrown. Long story short : a verisimilitude occurs when a character reaches full circle. Gerhard, yes, verisimilitude is certainly heightened when a character in a story acts ‘in character’. Thanks, Stephen. I do think it’s a very important topic in writing.